Wow, what wonderful weather we’ve had. First time in a long while I’ve been hoping for rain! Usually I’m bemoaning the cold wet summer and the impact on my plants, this year it’s the heat and dry weather that have taken its toll. I guess gardeners are never satisfied! Now it’s that time of year; you’ve worked hard for months, so the most important thing to do during August is to enjoy your garden; heady scents, glorious colours, an abundance of fruits and vegetables and hopefully a continuation of the glorious sunshine, even if it makes the weather charts look so boring. What could be more enjoyable and satisfying than surveying the results of your hard work? Right, enough sitting down and doing nothing, boring though it may seem, once you’ve had your 5 mins of rest, it’s time to get the hoe out and give the weeds another trouncing! Little and often is far less work than letting the weeds get a hold. If you have plants that overhang your lawn such as lavender, it can easily get chewed up by your lawn-mower as you cut the grass. To avoid this, use a combination of a bean pole and garden fork to lift the plant out of the way as you cut the grass – easy and effective. Remember to water and feed your plants regularly, especially those in hanging baskets, pots or containers as well as climbers and roses growing against a sunny wall. Many a plant will not recover from drought, so water regularly and do not resort to feast and famine. Water hydrangeas with hydrangea colourant for true blue hydrangeas next year and don’t forget our feathered friends – ensure bird baths are kept full of fresh clean water. If possible, set up an automatic watering system for your vegetable plot, borders and even containers. They are worth their weight in gold and can work on a sensor system that detects how dry the soil is. Once you have one you will wonder why you did not install one years ago. Going on holiday will no longer involve wondering if your precious plants will survive a dry spell or paying someone else to hold a hose! If the weather becomes warm and dry, water saving strategies include using bathwater and washing up water, provided they are neither too dirty nor oily. Keep your pond topped up, free of pond weed and clean – green algae can be toxic to pets. Towards the end of August sow hardy annuals directly into borders. They will overwinter and flower next summer. Cutting back the foliage and stems of herbaceous plants that have already died back (e.g. dicentra) is starting to be a priority. Don’t neglect hanging baskets – deadheading, watering and feeding will help them last through until autumn. Deadhead plants such as dahlia, roses and penstemon and bedding to prolong the display colour well into early autumn. Don’t cut off the flower heads of ornamental grasses. These will provide winter interest. Hardy geraniums can be cut back a little to remove tired leaves and encourage a new flush of growth. Prune climbing and rambling roses that do not repeat flower or produce attractive hips, once the flowers have finished. Many fruits are ready to harvest or swelling. Swelling fruit requires a lot of water so ensure they have enough. Watch out for over-laden plums and damsons. If needed you can support branches by inserting a length of 2×1 timber, notched at the top (like an old fashioned line prop) to support the branch or tie to the stem with robust twine. Protect autumn raspberries now with netting from the birds before the fruits arrive and the birds eat the lot. If you grow tomatoes, you know how easy it is to end up with a glut. 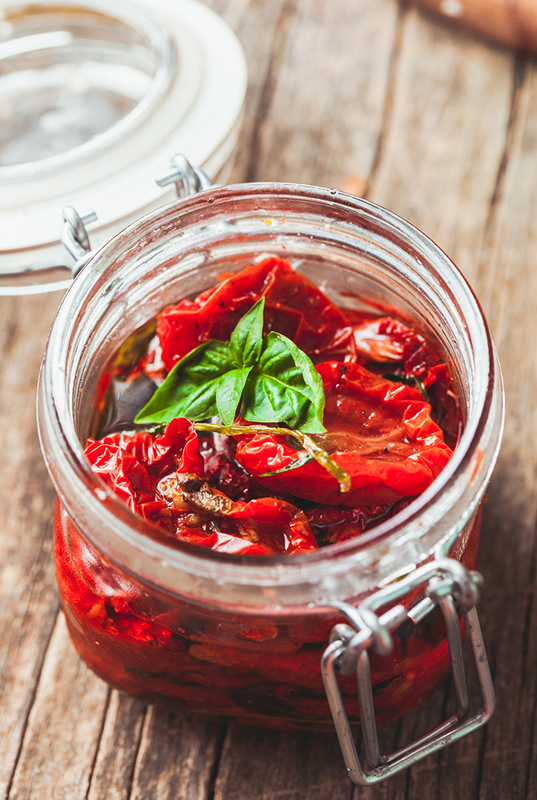 So here’s a recipe for oven dried tomatoes – great as an antipasto or chopped and sprinkled in salads. You’ll need ripe tomatoes, finely chopped fresh herbs (thyme or marjoram or rosemary) sea salt, freshly ground black pepper and olive oil. Cut the tomatoes lengthways and place on a baking tray. Season with salt and pepper, sprinkle with herbs and drizzle with olive oil. Cook on a low heat 90 to 100 ⁰C (Gas mark 1 to 2) for 4 to 5 hours. They’ll keep in an airtight container in the fridge for a couple of days. Or place in a jar with more olive oil, where they’ll keep in the fridge for up to 2 weeks. Don’t be tempted to neglect hanging basket maintenance – a little deadhead-ing, watering and feeding can keep them going until mid-autumn. Once they are past their best, re-plant as winter/spring hanging baskets with spring-flowering bulbs, winter heathers, trailing ivies and spring-flowering plants such as dwarf wallflowers. Continue to deadhead plants such as dahlia, delphinium, rosa and penstemon to prolong the display and give colour well into the month. Now is a good time to divide any overgrown or tired looking clumps of alpines and herbaceous perennials such as crocosmias. This will invigorate them, and improve flowering and overall shape, for next year. 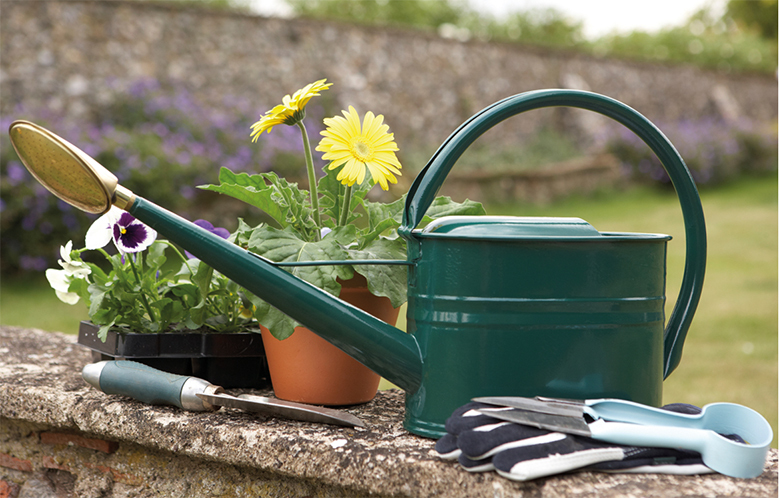 Take cuttings of tender perennials, such as pelargonium and osteospermum. These plants often do better grown from new cuttings each year. If you do not have a greenhouse, then use a light windowsill to grow them on. Bring inside any tender perennials, such as fuchsia, gazania, lantana and abutilon, before frosts cause damage. Wait for the first frosts to hit dahlias and cannas before lifting the tubers or rhizomes. A top tip for the end of the month, when your runner beans have finished is to lift half a dozen of your strongest plants, cut off all growth bar 6 inches, place them in a trug and cover with moist compost. Place them somewhere dark and dry to overwinter. Come the spring, water them a little and plant them out once they start sprouting (protecting from frost). They will shoot up the poles and produce beans weeks before plants grown from seed. Tidy up cultivated blackberries: Cut off the stems that have borne fruit and tie in the new stems that will bear next year’s fruit. This also applies to summer fruiting raspberries..
Strawberries also need attention: cut off the foliage about 1″ from the ground, clearing and weeding as you go. Any runners can be planted up to replace 3 year old plants that are best replaced now.